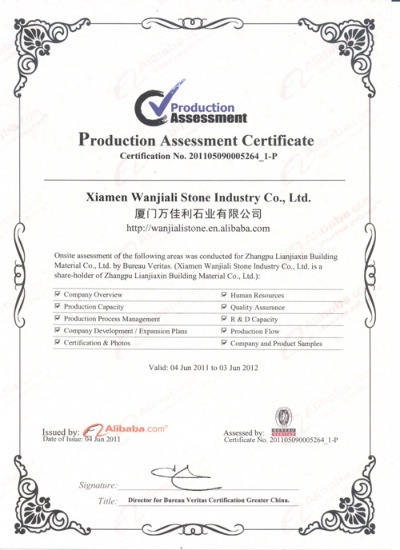 Company Overview - Xiamen Wanjiali Stone Industry Co., Ltd.
12YRSXiamen Wanjiali Stone Industry Co., Ltd.
.Xiamen Wanjiali Stone Industry Co., Ltd., established in 1993, is one of the most reputed, reliable and professional manufacturer and exporter of natural stone products in Fujian province, China. 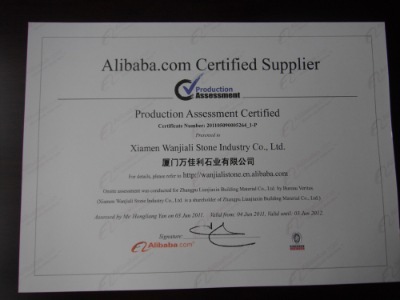 With more than 10 years knowledge and experience in stone field, we can provide professional service and competitive products for our customers.We supply most of stone materials quarried in China as well as many other popular stones selected from quarries all around the world, such as, Brazil, Italy, Norway, India, South Africa, Iran, Turkey etc. and export to USA, Europe, Australia and many other countries. Our stone materials range includes: Granite, Marble, Slate, Sandstone, Quartzite, and Basalt.Our competitive products include Slabs, Tiles, Skirtings, Window sills, Steps & Riser stairs, Kitchen countertops, Vanity tops, Work tops, Bollars, Columns, Curbstones, Paving stones, Cubes, Mosaic & Borders, Sculptures, Tombstones and Monuments.Our surface finishing range includes Polished, Honed, Flamed, Sandblasted, Rough hammered, Bush hammered, Rough picked, Mushroom, Axe-cut, etc. and our edges finishing range has Eased, Beveled, Bull nose, Ogee, Cove, Dupont, laminated, non-laminated and etc.Thanks to accumulated experience over the years from production, management and exportation as well as our working staff's constant efforts and diligence in their position, we are doing better and better, we have been satisfying our customers with quality products, timely shipment, competitive price and good service. Our commitment to each of our customers, who have been continuously giving us their kind understanding and support, is responsibility, efficiency, trust and serious attitude. We treasure every cooperation opportunity and hope to keep long-term business cooperation relationships with all customers around the world. 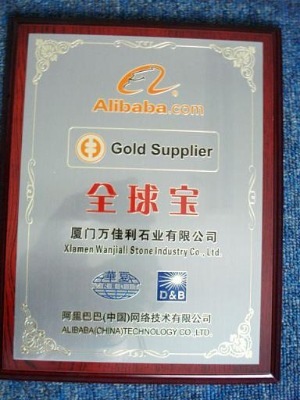 In the future we will continue to provide our best service and quality products to meet customers' demand.